Unless you’re living way off the grid (and I’m a little jealous if you are), you’ve likely noticed a monster push in the OPE (outdoor power equipment) industry towards lithium-ion lawn equipment. Major tool manufacturers have been on the front lines of lithium-ion technology and they’re not about to miss the boat. DeWalt is one of the few to offer OPE across multiple voltages and they’ve launched their first DeWalt lawn mower models. While DeWalt offers a clear delineation in their line – 40V Max is commercial, 20V Max is job site, and FlexVolt is for the homeowner – the line gets a little blurry here. For the 40V Max crowd, you have a dedicated platform. For 20V Max and FlexVolt users, you’re looking at a 2-battery system that uses a series connection to bring the voltage up to 40V Max. DeWalt doesn’t list a specific material for their metal deck, but we can assume it’s steel. 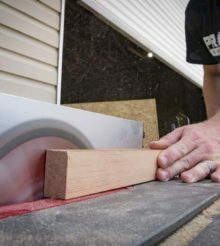 The trade-off between a plastic deck and steel one is always going to be better durability with higher weight for steel. As long as you stay on top of your lawn care, the extra weight shouldn’t be a big deal here and the extra durability is worth it. The deck is a pretty standard 20″. A handful of manufacturers are giving you 21″ now and Greenworks hints at a 25″ option for the near future. For now, there’s nothing wrong with this size. Mulch, Bag, or Side Discharge? For me, having 3 collection/discharge options is a must. I never bag, but every mower seems to come with a collection bag anyway. The world doesn’t revolve around my preferences, though. That’s obvious in that some mowers forgo side discharge and only add mulching. I usually mulch, but if the grass is wet, I want a side discharge option to keep grass from collecting in a thick layer around the deck. The DeWalt lawn mower gives you all 3 options… sort of. The side discharge is a rear discharge. It makes sense since they already design an evacuation channel for the bagging system. For kit options, you can get the DeWalt lawn mower as either the 40V Max DCMW290H1 with a 6.0 Ah battery or the 2 x 20V DCMW220P2 with a pair of 5.0 Ah batteries. Technically, you get 20% more watt-hours in the 40V kit, but there are a whole lot more of you on the 20V Max and FlexVolt battery platforms for your power tools. The 40V Max kit runs $379 and the 2 x 20V Max kit is just $20 more. That’s a competitive price for a steel deck push mower kit. The feedback I’m hearing so far is that the mower gets the job done and is reasonably well-built. The issue most people are having is with the runtime. That begs the question – is it time for DeWalt to put their new FlexVolt 4.0/12.0 Ah batteries into service in a new kit? Maybe. But you know what they say about internet rumors as well. Since I don’t like to leave with just what the general “they” have to say, let’s turn things over to our team at OPE Reviews where they’ve spent some time getting to know the pros and cons of the new DeWalt lawn mower. Dewalt flexvolt is a 20/60 volt battery. I’m surprised the lawn mower isn’t a a 60v or a 120v with 2 batteries. I guess it doesnt need the torque or its still in the works.